At the 9:06 mark, Tim Cronin put the Avalanche on the board first, scoring on a second chance opportunity in the slot. Both Cameron Weitzman and A.J. Przystawski assisted the goal. Jake Ballagh put the Avalanche up 2-0 with a goal at the 3:38 mark thanks to a nifty pass from behind the net by Kerbrat. Adkins had the second assist on the goal. Recently named EHL Defensemen of the Year, Niks Krollis, gave the Avalanche a 3 goal advantage at the 5:31 mark of the frame with a shot from the point through a heavy screen. Both Adkins and Kerbrat collected assists on the goal. 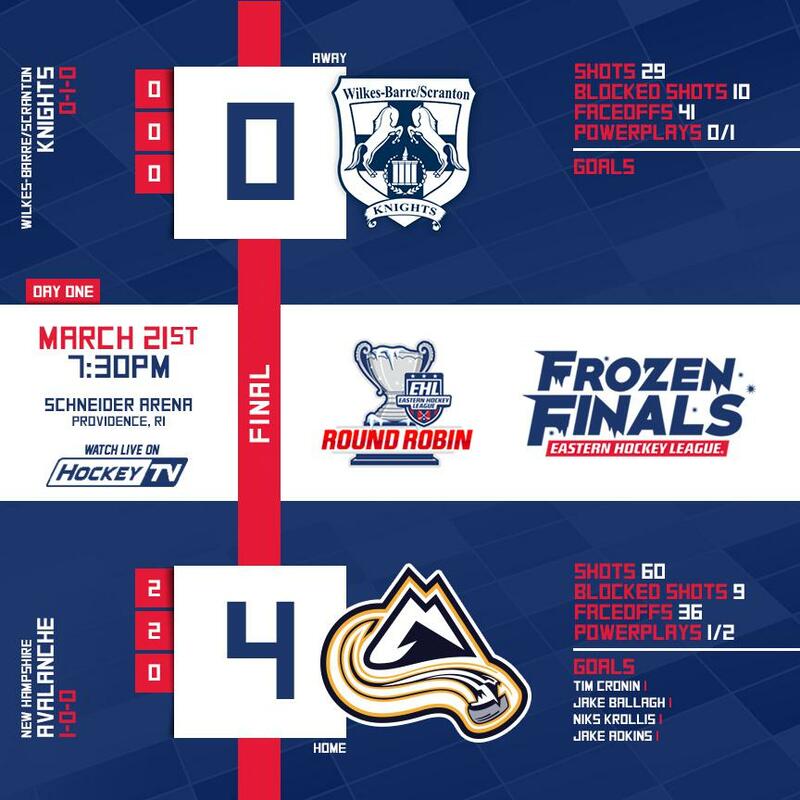 At the 2:27 mark, Adkins collected his own rebound in the slot and put the Avalanche ahead 4-0 with a power play goal that was assisted by both Krollis and Jake Mendeszoon. Nathan Pickett held off the Knights in the third, stopping 26 total shots for the shutout win.